Wall-mounted jib cranes are a great material handling solution for busy factory floors and facilities with multiple obstructions overhead. That’s because wall-mounted jibs require no floor space and no special foundations, and they quickly fold out of the way of larger overhead cranes. Wall-mounted jibs provide crane coverage of a semi-circular area, which is perfect for individual workstations or to supplement an existing bridge crane. With standard spans up to 30 feet and capacities up to 5 tons, these ergonomic systems are both economical and heavy duty. Many manufacturers offer two different types of wall-mounted jibs: a cantilever design and a tie-rod supported design. Both designs provide 200-degree rotation and can be mounted to a structurally adequate wall or column support. The difference between the two is in how they are mounted and the unique advantages of each. A wall-mounted cantilever jib crane consists of a horizontal boom attached to a vertical mast, which is mounted with brackets. 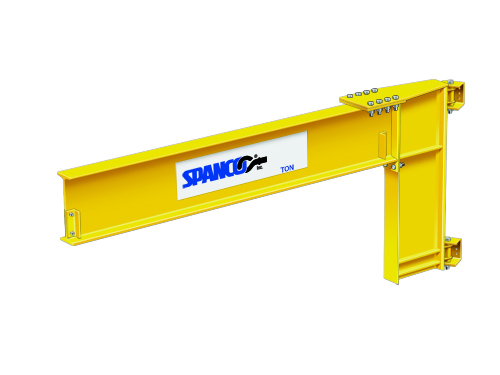 Because the cantilever design utilizes a partial mast and full boom, these systems provide maximum clearance in factories with multiple overhead obstructions. A wall-mounted cantilever jib crane can be installed in very tight locations and as close to the ceiling as possible for the best use of space. Furthermore, wall-mounted cantilever jib cranes transmit less direct force to building columns and support structures than tie-rod supported jibs. That’s because the brackets, which are used to mount the mast to the wall or column, are further apart than on a tie-rod supported jib. For instance, a 1/2-ton capacity wall-mounted cantilever jib crane with an 8-foot span includes brackets that are (roughly) four feet apart. In comparison, the tie-rod supported system with the same capacity and span includes brackets that are (roughly) three feet apart. The cantilever design with 4-foot bracket centers imposes a thrust/pull force of approximately 2,600 pounds; whereas the tie-rod supported system with 3-foot bracket centers imposes much more force—approximately 3,710 pounds. 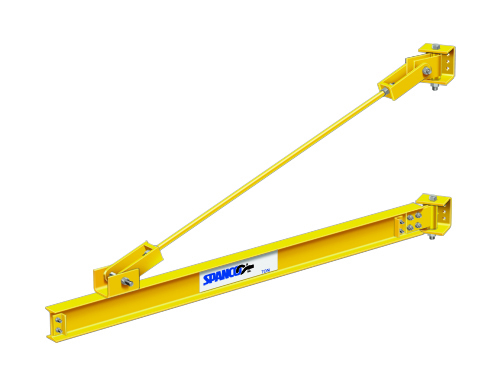 The tie-rod supported design is one of the most economical wall-mounted jib cranes available. Although the cantilever design offers more clearance under and above the boom, the tie-rod design provides the greatest clear span. The whole system consists of a standard I-beam suspended from a vertical support structure with a single tie-rod and brackets. The tie-rod is suspended overhead, which means it uses more room above the boom, but it also allows the trolley to travel over a longer span because there’s no mast to obstruct movement. The single tie-rod is also beneficial because it eliminates problems with off-center loading. This system is the perfect solution for busy factories with multiple floor obstructions and plenty of overhead room. Compared to other jibs, the tie-rod supported system is an inexpensive solution for large facilities looking to install multiple jibs throughout the building without obstructing operations below the boom. Whether you need a lot of extra clearance—under or above the boom—or additional travel span for your trolley to move the full length of the boom, wall-mounted jib cranes are an economical solution for moving materials within an individual workstation or to supplement larger overhead crane systems like monorails or bridge cranes.